All transactions are safe and secure with a reliable history in online purchasing behind each of our associates. Buy The Expendables Skull t-shirt to own Rambo clothing and merchandise. Pair this stylish Expendables skull design with a Rambo t-shirt for the ideal Sylvester Stallone combination. Whether he operates as a deadly one man army or as part of a team of mercenaries, Sylvester Stallone rarely disappoints. As John J., you might find him hiding in a wall of mud or using a reed to breathe underwater. Regardless of where he is, he will be waiting with his Rambo survival knife in hand. 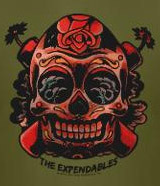 Use this design to let everyone know that you are one of the Expendables. In addition to The Expendables Skull tee above, browse the Rambo Clothing Gallery for more apparel like men's and women's clothes, kids shirts or hoodies.